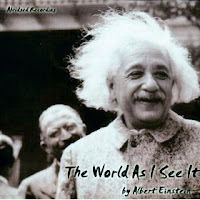 How I See The World is a PBS Documentary on Albert Einstein, one of the greatest scientific thinkers of all time. His theories on the nature of time and space profoundly affected the human conception of the physical world and set the foundations for many of the scientific advances of the twentieth century. As a thinker on the human condition, politics, and all issues of the day, he was as well-respected as anyone in his time. Born in Ulm, Germany in 1879, Einstein was brought up in Munich. His parents were of Jewish German ancestry, and his father ran an electrical equipment plant. He did not speak fluently until after he was nine and was considered slow. Though his grades were fair in high school, he was eventually expelled for his rebellious nature. Always an individual, he traveled around before re-enrolling and completing school in his new home in Zurich, Switzerland. After graduating from high school, Einstein enrolled in the Swiss Federal Institute of Technology, where he studied the works of classical physicists. By 1900 he graduated with a teaching degree and three years later married his college sweetheart, Mileva Maric. Unable to find a teaching job he tutored high school students until beginning work at the Swiss Patent Office. His job at the patent office allowed much time for independent work and it was during these seven years that he made his most important discoveries. By 1905 Einstein had brought together much of the works of contemporary physicists with his own thoughts on a number of topics including the nature of light, the existence of molecules, and a theory concerning time, mass, and physical absolutes. The “Theory of Relativity” proposed a revolutionary conception of the physical world, suggesting that time, mass, and length were not fixed absolutes, but dependent on the motion of the observer. Two years later he presented his equation E=MC2 (Energy equals mass times the speed of light squared). With this early work Einstein unhinged the assumptions of the absolute within the physical world and set the course for the scientific investigations of the century. Though the Theory of Relativity was to be his most famous, his other work that year was equally important. With his publication of the article, “On the Movement of Small Particles Suspended in a Stationary Liquid Demanded by the Molecular-Kinetic Theory of Heat,” he abandoned Newton’s theory that light was made of particles, in exchange for one that presented light as being made of particles and waves. It was for this work with light that he was eventually awarded the Nobel Prize (1929) for physics. 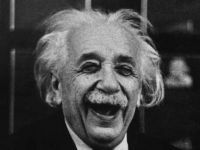 Not immediately recognized for the important thinker he was, Einstein moved through a number of teaching jobs before being offered a research position at the University of Berlin in 1914. Soon after his move to Berlin, Einstein was divorced by his wife and married his cousin Elsa. During the 1920s Einstein’s fame grew and he spent much of this time traveling throughout the world with Chaim Weizmann, the future president of Israel, promoting the cause of Zionism. By the early 1930s the growing threat of Nazi fascism had made it impossible for Einstein to continue working in Germany, and he moved to Princeton, New Jersey. There, while teaching at Princeton University, he continued to elucidate his theory of relativity and work on new theories that brought together our understanding of other physical phenomenon. It was from Princeton, in 1939, that Einstein signed a letter to President Franklin D. Roosevelt discussing the possibilities of creating an atomic bomb. Though Einstein was never directly involved in the creation of the bomb, it was his earlier theories that had paved the way for its possibility. After its eventual use on Hiroshima and Nagasaki, Einstein became a constant and vocal activist for peace—spending much of the rest of his life speaking and writing on the subject. By the time of his death in 1955, Einstein was considered by many not only the most important scientist of his time, but the smartest man alive. It is impossible to understand how different the events of the last hundred years might have been without the work of Albert Einstein. Not quite true he wasn't quite quickly recognized as an important thinker. The "teaching jobs" were as professor of theoretical physics at the University of Zurich, University of Prague, and the prestigious ETH at Zurich. By 1911 he was recognized to be among the leading physicists of the time by being invited to the Solvay Conference. In order to understand serious challenges to Einsteinian THEORIES I really encourage you to Google Eugene Mallove.